Today’s guest speaker: Steve Rowe from Rowe’s nursery. ’Local success with Avocadoes’ and question and answer time. AGM: Election of office bearers for the coming year. Please consider accepting a position on the committee. New faces are always welcome. Yearly subs will be due and payable - $15 per person (unless changed at the AGM) for the year ahead. RHSV Melbourne International Flower & Garden Show & the Great Victorian Hanging Basket Competition. Wednesday 27th March to Sunday 31st March. 9am to 5pm all days except Friday till 9pm. Garden Club bus trip arranged for Friday 29th March. Leaving Warragul 8.00am (Burke Street), Drouin (Car wash) 8.15am, Pakenham 8.45am. Cost $29 members, $34 non-members. Entry to Flower Show at own cost. Only a few seats left. Tesselaar Kabloom Festival of Flowers.Saturday 6th April to Sunday 28th April. 10am to 3pm daily. Lots of colourful flowers, Flower circus, food, stalls. Entry $25 Adults, Concession $22. www.kabloom.com.au 337 Monbulk Road, Silvan. Once enough rain has fallen, April is probably the best month for planting seeds, seedlings, shrubs and trees that have been grown in containers. The soil is warm and stimulates root growth. Flower garden. Plant Sweet Pea seeds. Plant seeds of Viola, Pansy, Calendula Cineraria, Alyssum, and Primulas. Seedlings of Polyanthus, Hollyhocks, Lupins, Stocks, Verbena, Iceland Poppy, Pansy and Viola planted now will begin to flower early and then flower right through winter. Violas will flower right through until the end of November, especially if grown in pots. Plant Pansies in a slightly shaded position for the Spring as they are not as heat resistant as Violas. Spring bulbs such as Tulips and Daffodils are best given 3-4 weeks in the fridge in brown paper bags before planting. This convinces them that winter is over! Bulb planting should be complete by the end of the month. Select and plant new Camellias. Sasanquas should be in flower by the end of the month. Home Orchard. Complete giving Citrus trees a dressing of a good Fruit Tree & Citrus fertiliser to swell the size of the fruit and to improve sweetness. Water-in the fertiliser thoroughly and remove all weeds from the base of the trees. Plant new or replacement trees. Lemons, Oranges, Grapefruit and Mandarins all do well in this local area. Lawns. March and April are the best months to sow new Lawns, with seed usually germinating in less than a week. The use of a Lawn Starter fertiliser when sowing the seed will pay dividends. It is also the best time to repair patches in old lawns. If after rain lots of weed seedlings occur use a recommended lawn weeder spray. Grow it big: Make a name for yourself and try to beat these world records – Longest cucumber 130.5cms (grown by an Australian teenager), heaviest beetroot – 23.4kgs, longest beetroot – 7.212 m (UK), Heaviest cabbage – 62.71kgs, heaviest pumpkin – 1503 kgs (Switzerland), largest carrot 9.07kgs (UK), heaviest Marrow/zucchini 93.4kgs (Netherlands), Largest Leek – 9.75kgs (grower played Glenn Miller music to it), Heaviest potato – 4.98kgs. Growing tips: Choose the right variety of seed, compost the soil a few months before planting, test the soil each season. Measure Ph, salts, and nutrients potash, phosphates & potassium. Dig over soil to aerate before planting seed, feed the plants like giants, use slow acting organic fertilizer and know which fertilizer suits the particular plant, give regular deep watering, set up an irrigation system with drippers and a timer, make a compost tea to pour near plant, lengthen the growing season by starting plants in a heated glass house if possible, make sure quality soil is deep enough or use raised garden beds (particularly for root vegetables). Pollinate flowers by hand to prevent cross pollination by bees (best done early morning), prune off all but a few of the best ‘fruit’ and reduce back to a single one later on giving it the best chance to become a giant, keep an eye out for pests and remove by hand, checking every day. Be patient and talk to them if you like. Good luck! How did the person who made the first clock know what time it was? Housework can’t kill you, but why take a chance - go out into the garden instead. Next meeting: Monday, 29th April 2019 commencing at 9.45am. Doors open 9am for setting up. Entries for show bench to be placed for judging prior to 9.30am. Guest Speaker: Access Rehabilitation. Learn about aids to assist people with daily living and mobility problems. Rowes nursery, ture of peet moss and top soil. The potatoes keep the stems moist and help develop the root systems. 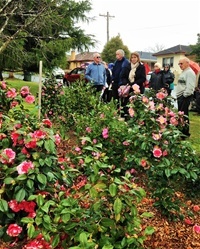 It's a perfectly simple way to multiply your rose garden without spending lots of $$$.Landsborough Road, Warragul. rowes@dcsi.net.au They have a large range of plants for sale, a wealth of garden knowledge and ask about receiving their regular email newsletters. Drouin Home Hardware, Princes Way, Drouin. (On the Melbourne side of Drouin) Check their hardware, gardening products and plants. Kurinda Roses, Warragul-Lardner Road, Warragul. Select from their huge range of roses at reasonable prices. They also have a lovely range of garden related gifts for sale in their shop. Today’s Guest speaker: Helen Lovell from Neutrog. Hear about the latest fertiliser – ‘Who Flung Dung’. Herb & Chilli Festival. Saturday 16th & Sunday 17th March. Everyone receives a free book & program, free plant, free activities for kids. 80+ stalls, cooking demonstrations, speakers. Sweet & savoury food, drinks, handcrafts etc for sale. Most food under $10. Worlds best hot sauces. Free parking. Entry Adults $24/ Concession $18/U14 y.o. free. 125 Quayle Road, Wandin. RHSV Melbourne International Flower & Garden Show & the Great Victorian Hanging Basket Competition. Wednesday 27th March to Sunday 31st March. 9am to 5pm all days except Friday till 9pm. Garden Club bus trip arranged for Friday 29th March. See Howard for bookings. The soil will remain warm enough right through until the end of April, so as soon as the Autumn rain arrives take the opportunity to sow relevant seeds. Unfortunately, this is also the time that weed seeds germinate in abundance so be ready to deal with that challenge. Flower Garden: Sow seeds of Carnation, Aquilegia, Alyssum, Cineraria, Delphinium, Dianthus, Polyanthus, Primula, Snapdragon, Viola and Wallflower. Alternatively purchase seedlings of the above and establish early. Planted by the beginning of April, Violas will last right through until early December. Once the ground has been well wetted, select new plants to replace those lost during summer heat. Autumn is the best time of the year to plant trees and shrubs from pots as they will establish a new root system before next summer. Bare rooted planting should not begin until mid-May. Vegetable Garden: Plant seeds of Beetroot, Cabbage, Turnip, Radish, Cauliflower, Broccoli, Silverbeet, Spinach and Spring Onion. Again, many of the above can be purchased as seedlings if required. Watch for signs of caterpillar damage on cabbages etc and take action. Orchard: Look for signs of Black Mould that usually indicates the presence of Scale. Ants running up the trunk of trees can be another sign. Spray with White Oil twice at an interval of a month. For heavy infestations it may be necessary to use an initial spraying of a Scale preparation that incorporates an insecticide. Citrus trees should receive a dressing of Fruit Tree Fertiliser during March to swell the fruit and increase sweetness. Lawns: Mid-March to the end of April is the best time to establish new lawns. Kept moist seed will germinate within a week and the new lawn will be ready for its first light mowing within 5 weeks. The use of a specially formulated fertiliser for seed or turf laying will pay dividends. Do not purchase ordinary lawn fertiliser as this will burn the new roots as they appear. Make sure the area is firm before sowing the seed. You know you are an avid gardener when the favourite tune you sing to your plants is “Raindrops keep falling on my Head”! Bus trip report: Members and friends enjoyed a day visiting the Blue Lotus Water Garden, Kuranga Native Nursery and the Yarra Valley Chocolaterie. The weather was perfect and the lotus and waterlilies were at their best, blooming in a wide range of colours. Prior to our walk around the 14 acres of lakes with fountains and gardens we were given an informative talk about the property, from its beginnings as a vegetable farm to what it is today. Heated greenhouses had displays of tropical plants, including the giant Amazon water lilies with their massive lily pads up to 2 metres in diameter. The café served food and drinks; also, on the menu were chips made from lotus pods. Kuranga Native Nursery was well set out with plants arranged in their growth sizes, from ground covers to tall trees. Also for sale were garden ornaments and gifts. On alighting the coach at the chocolate factory, everyone quickened their step to the chocolate “heaven”. Free samples were tasted and quite a number of ice-creams and chocolate drinks were devoured. Chocolates were under production in the factory and the process could be watched through the large viewing windows. Many bags of chocolates were purchased to take home. A great day was had. Next meeting: Monday, 25th March 2019 commencing at 9.45am. Doors open 9am for setting up. Entries for show bench to be placed for judging prior to 9.30am. Guest Speaker: Steve Rowe (Rowe’s nursery) – ‘Local success with Avocados’. Q&A.Want to know how to deal with a garden problem, find the name of a plant, or get advice on what to grow where? Ask Steve.